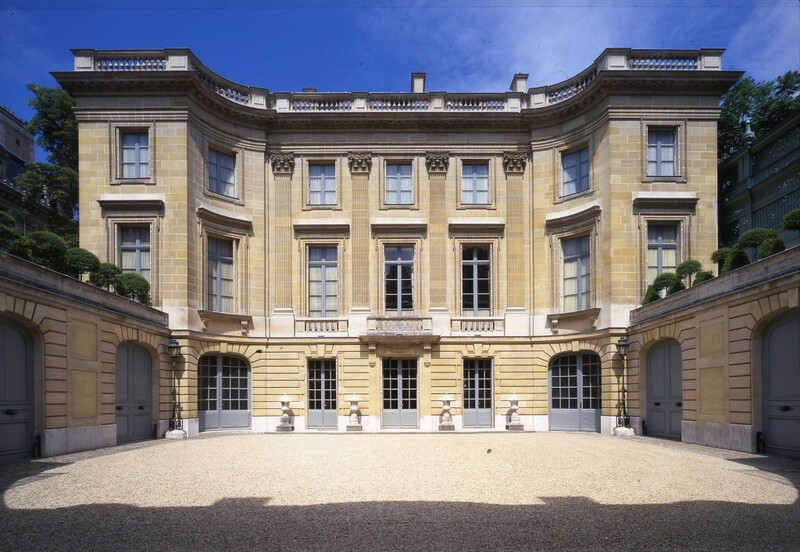 Today is the 70th anniversary of the liberation of Auschwitz, and I’ve been thinking about a decorative-arts museum: the Musée Nissim de Camondo in Paris. That’s not as strange as it might seem, because that museum has a tragic history that has been on my mind for months. I visited the museum in 2010. It’s a mansion that was built in the early 1900s by a banker named Moïse de Camondo. He was passionate about furnishings from the 18th century and decorated the house accordingly. 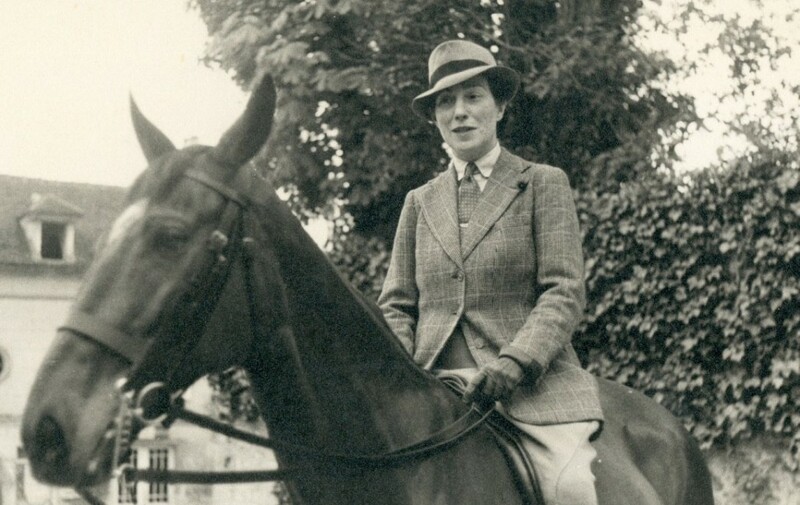 Moïse’s only son, Nissim, died in combat while serving France during World War I. Moïse’s daughter, Béatrice, was more interested in equestrian activities than her father’s collection. As a result, Moïse left the building and all it contained to the country of France, requiring that the museum be named after his son and his collection remain exactly as he left it. Moïse died in 1935 and the museum was inaugurated in 1936. Musee de Nissim de Camondo. 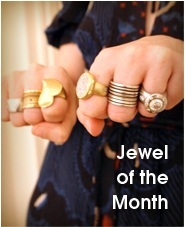 From the museum’s website. Click for source. The family apparently lived an assimilated, secular life, but all of its members were identified as Jewish until the late 1890s, when Moïse’s wife, Irène Cahen d’Anvers, converted to Catholicism after falling in love with the Italian manager of the family’s stables. 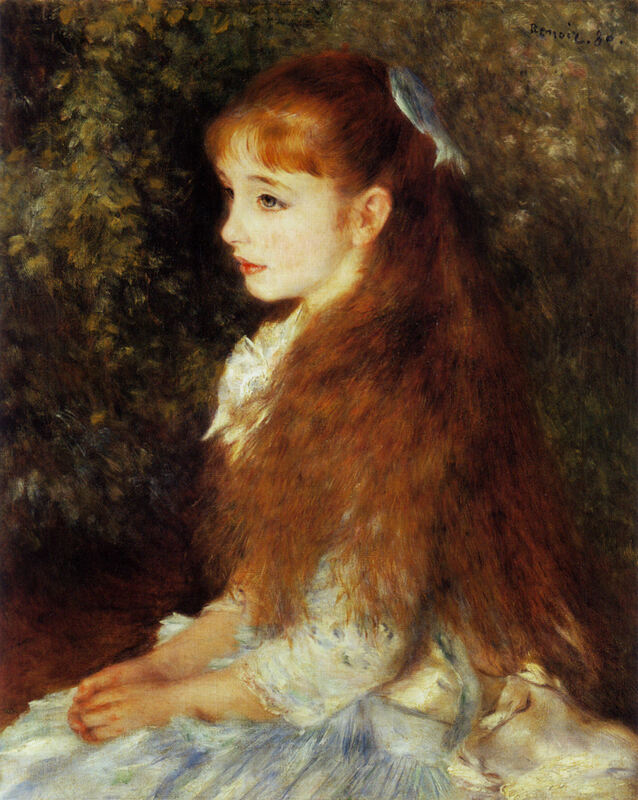 When Irene was young, her portrait was painted by Renoir. Click for more information about the painting. Béatrice de Camondo. Click for source. It is so easy in hindsight — knowing all that we do about the death camps — to think, “Why didn’t these people leave when they had a chance? Go to another country?” As I said at the start of this post, I’ve been thinking about the Camondos for months and the phrase “fatally convinced that she was French” sums it all up. Just as Béatrice was born in France, so was I born in the U.S. — New York, to be precise. I have no link to any other country. When I’m traveling and people ask me where I’m from, I say, “New York.” If someone continues the conversation by saying, “So you’re American?” (after all, citizens of other countries do live here), I sometimes tease him or her and say, “No, I’m a New Yorker. It’s different.” Other times, of course, I just say “Yes.” Even if New York seems like its own little country at times, I’m definitely an American. I’m not French, Mexican, Korean, Bajan, Congolese, Israeli or any other of the nearly 200 nationalities we could name. I hold a U.S. passport and no other. I am convinced that I have certain rights as an American. I happen to be a totally secular American, with no involvement in any organized religion. But my family has always been Jewish, and what I’ve been brooding about recently is the fact that if “they” decided to round up all the Jews here, it wouldn’t matter how I thought of myself. I’d be rounded up just like Béatrice was rounded up in France. How was her deep belief that she was French any different than my conviction that I’m American? It’s not like it can’t happen here. To take just one example — and I’m picking this one because it happened right around the time that Béatrice was still holding on to something of her old life — President Franklin Delano Roosevelt signed a February 1942 order that put over 100,000 people of Japanese ancestry into concentration camps in the U.S. The fear was that these people would betray America and help Japan, which had attacked Pearl Harbor in Hawaii on Dec. 7, 1941. However, the majority of the incarcerated were U.S. citizens, born in America. Many had never been to Japan. Some of them had even fought for the U.S. during World War I. Families were split up and, like the Jews of the Spanish Inquisition or the Holocaust, the Japanese victims had to sell their businesses, homes and other assets in a panic, for far below their value. (The neighbors always benefit from these things.) Fortunately, FDR didn’t recommend a Nazi-style “final solution” of total genocide, but the fact that something wasn’t any worse that it was doesn’t make it any good. One might think, “That was 72 years ago. Couldn’t happen now!” But since Sept. 11, 2001, there have been people calling for concerted actions against Muslims and Iraqis living in the U.S. Terrorist attacks like the Boston Marathon bombing or the recent massacre at the Charlie Hebdo office in Paris give new fuel to those who argue it’s a matter of public safety to treat vast groups of ordinary U.S. citizens as if they were criminals, just in case that helps catch a few actual criminals. After all, “… the successful prosecution of [the] war requires every possible protection against espionage and against sabotage to national-defense material, national-defense premises, and national-defense utilities,” or so it said in Executive Order 9066, signed by FDR in 1942. Even so, it wasn’t Al Qaeda or ISIL that has made me muse upon the Camondo family for so long. It’s been the police shootings of black men all over the country. U.S. citizens killing U.S. citizens in the street, acting as if there’s only one half of the phrase “law and order.” Cops saying their own fear justifies acting as judge, jury and executioner. Plenty of people have argued that hoodies are scary or that the theft of something almost worthless should be expected to turn into a fight to the death. Except the violence isn’t caused solely by common clothing styles, or being a big guy, or committing petty nuisance crimes. You can be a 12-year-old kid or a Yale student leaving a library or someone walking down the stairs because of unreliable elevators. Last year, ProPublica reported that its analysis of data on fatal police shootings found that “young black males in recent years were at a far greater risk of being shot dead by police than their white counterparts – 21 times greater.” So, as black parents have to tell their kids, it doesn’t matter who you think you are or who you actually are when it comes to facing deadly prejudice. Even if you have the exceptional wealth and connections of a Béatrice de Camondo, that won’t matter when a guy is ready to shoot you two seconds after seeing you. To put it in plainer language, top Nazi Himmler said, “I need to kill lots of Jews. I will do it in Auschwitz.” Even my tour guide was forced to admit that 90% of the people who died at Auschwitz were Jews. According to Yad Vashem, more than 1.1 million Jews were killed there, as well as 70,000 Poles, 25,000 Sinti and Roma (Gypsies) and some 15,000 prisoners of war from the Soviet Union and elsewhere. A large percentage of the murdered Jews were from Hungary: In just eight weeks in 1944, about 424,000 Hungarian Jews — around half of Hungary’s Jewish population — were transported to Auschwitz. 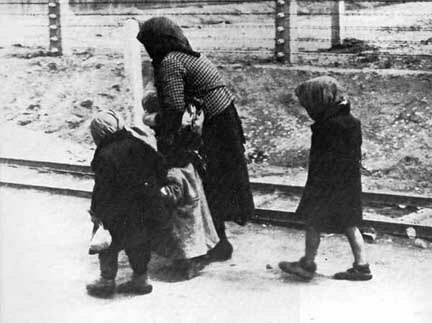 Approximately 320,000 of those got off the train and went directly to the gas chambers. Photo of Hungarian Jews walking to the gas chamber, courtesy of Yad Vashem. Click for source. All lives do matter, obviously, and the number of Polish inmates murdered at Auschwitz is huge and deplorable, but Auschwitz’s main purpose was killing Jews. A single religion was the No. 1 target for extermination. There was no balance in Auschwitz, no equity. Thankfully, in the U.S., we are not currently rounding up thousands or millions of people — identified by race, religion, political inclination, gender, sexual preference or any other excuse — physically shoving them into cattle cars without food and water, transporting them far away, and literally gassing them to death. I’m not saying that the discrimination and resulting violence that happens here today is anything like the death machine that the Nazis created. But, to repeat what I said about the U.S. camps for people of Japanese ancestry, the fact that it isn’t worse than it is doesn’t make it good. It shouldn’t stop us from making our society better. And this train of thought is what I got out of a decorative-arts museum, which is more edifying than the surprise I got during the Auschwitz tour years earlier. On the bus, on the way from Krakow, Poland, to the Auschwitz site, our tour group was given colored stickers so we’d be able to identify each other and stay together. They gave my group square yellow stickers. I nearly passed out. 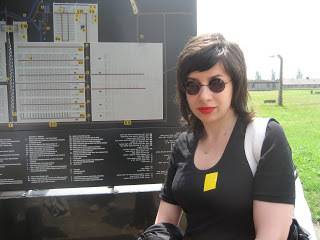 For real, I had to wear a yellow sticker to visit Auschwitz. Click for original post. It will always be too soon for any yellow stickers at Auschwitz! Related reading: Check out the tale of my grandfather’s cousin Max, who survived a German slave camp and married a hometown girl. I’m trying to articulate a comment that says everything I want to say… Wow. Really moved by your stories, and your insight and bravery to state what you have stated. People don’t want to know, they don’t want to believe that anything like this could happen at home, in the past or the future. Our MP pretty much mocked us when we, as Canadian immigrants living in the UK protesting the proposed biometric tracking we’d have to submit to in order to live here and re-enter the country (which was implemented soon after), tied this procedure to certain terrible events in the early mid-century. It’s not paranoia, it’s not fear, or blowing things wildly out of proportion, it’s simply understanding what lead to these horrific events and recognizing that these factors are truly alive and well today. People think so literally, in terms of concentration camps and gas chambers, that his horror couldn’t possibly be repeated. But there are many parallels, as you have cited, with regards to dehumanizing our own neighbours and deciding whether they have a right to continue living in ‘my country’. “Cops saying their own fear justifies acting as judge, jury and executioner.” There it is. As just one example. 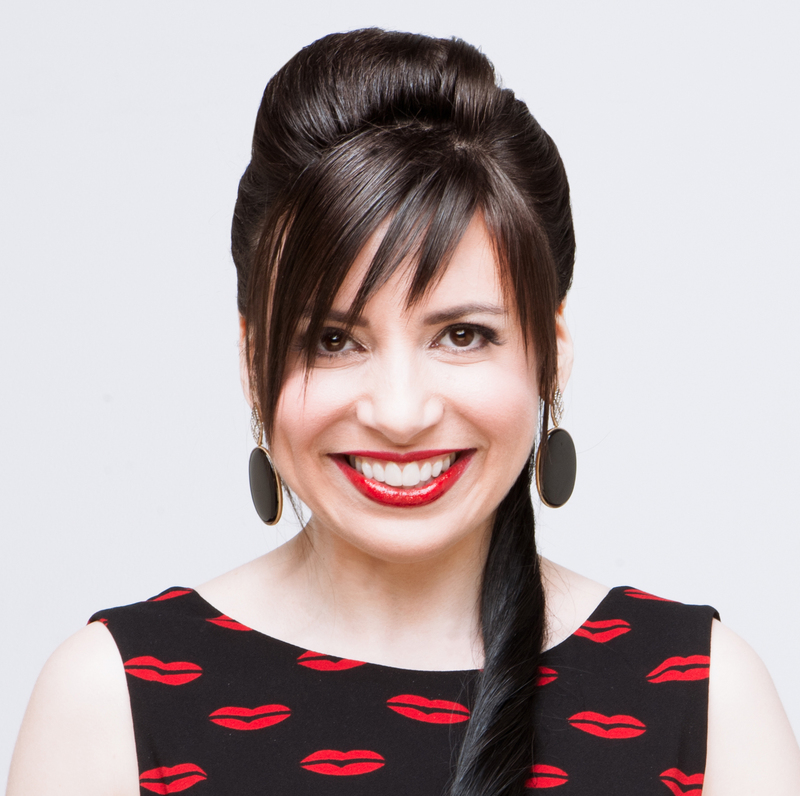 Denise, you deserve some kind of award for reading this whole post — I figured no one would! There’s a new book called The Killing Compartments by Abram de Swaan that’s about the social and psychological conditions that lead to genocide. The one review it got on Amazon is negative, but the Wall Street Journal review was good so I think I’m going to get it: http://www.wsj.com/articles/book-review-the-killing-compartments-by-abram-de-swann-1420841846 I’m hoping it will provide insight into conditions today. That makes that timing seem awfulllllly convenient! Wendy, I fear the repeat of the past. If it happens somewhere else, it can happen here. Brilliant article. We have to remind ourselves that this happened in our parents’ lifetimes, in Christian Western Europe. We visited the Holocaust Museum in St Petersburg, FL and were moved to tears many times. They have an actual railroad car that transported Jews to one of the camps. Chilling. We are the best and the worst of the animals. Seeing those original artifacts is very impactful. I’m glad that museum had the railroad car. Well said, Wendy. I feel increasingly that when a society is defensive about (or tries to explain away or minimize, as the #Alllivesmatter camp does) the injustices it’s committing, it has the same effect as forgetting history and thus ensures that we’ll repeat it. And we should never forget. I can’t remember where I read it but someone made a good comparison to “Feed the Hungry” — you wouldn’t change it to “Feed Everyone,” even though obviously everyone does need food. Didn’t realize where that came from and could not remember most of it. Didn’t realize how famous it is. Still. It’s very true. You have to fight for everyone otherwise who will fight for you? 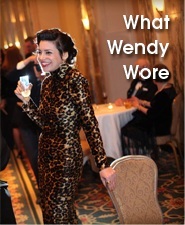 Excellent article, Wendy. I recently read “The Hare with the Amber Eyes” by Edmund de Waal (the famous potter) who traced his Jewish ancestors in Paris and Vienna. It’s shocking to read how they were treated (they were rich bankers), and hard to believe that people let it happen. But you’re right – it happens now, we do the same things now, and we think we are not repeating ourselves. Thank you for this reminder – we must never forget the atrocities we are capable of. I just put that book in my cart on Amazon! While I was writing this post, I collected a bunch of related books that I want to buy. Very powerful post, Wendy. Your visit to Auschwitz must have been incredible, but somber. BTW, I will never let “them” take you for being born Jewish! Poor Beatrice… a very sad end for her. I hope the world never comes to this again, but as you point out, fear and prejudice still run rampant. Pweez to not let them take me!